A friend of mine stumbled upon a wolf den with pups while shed hunting a month ago. The pups were about four weeks old, he said. 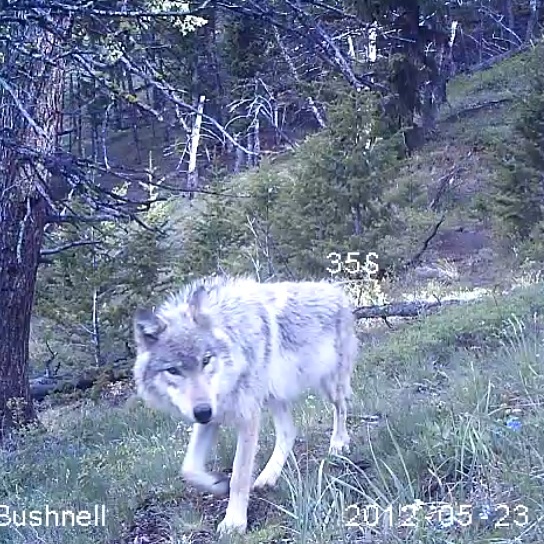 Apparently, his inadvertent presence caused the wolves to move their pups to another location, for although I put my trail camera on the den site, I never saw any activity and only got this one photo of a male wolf returning to the area to investigate. I waited a month to be sure that the pups were old enough to have left and inspected the site. What a feat of engineering. 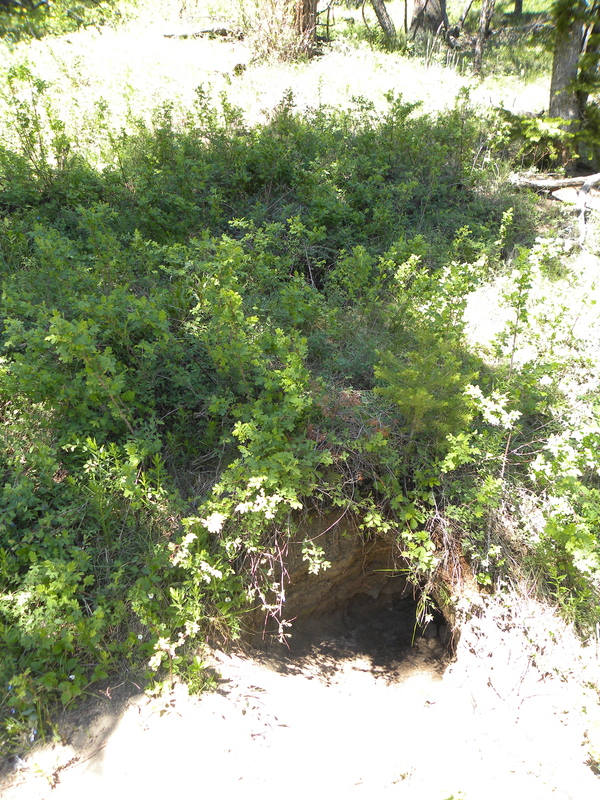 The den was on a hillside in a small drainage. The den was essentially a tunnel with an entrance above and below. My dog is 90 pounds and he was big enough to crawl inside the tunnel entrances, but too big to enter the tunnel connector. Here he is for size at the lower entrance. Although this site had been abandoned for several weeks with overgrown vegetation, it was perfectly clean inside and out. I looked around for bones. There were some deer bones but quite a ways down hill from the den site. 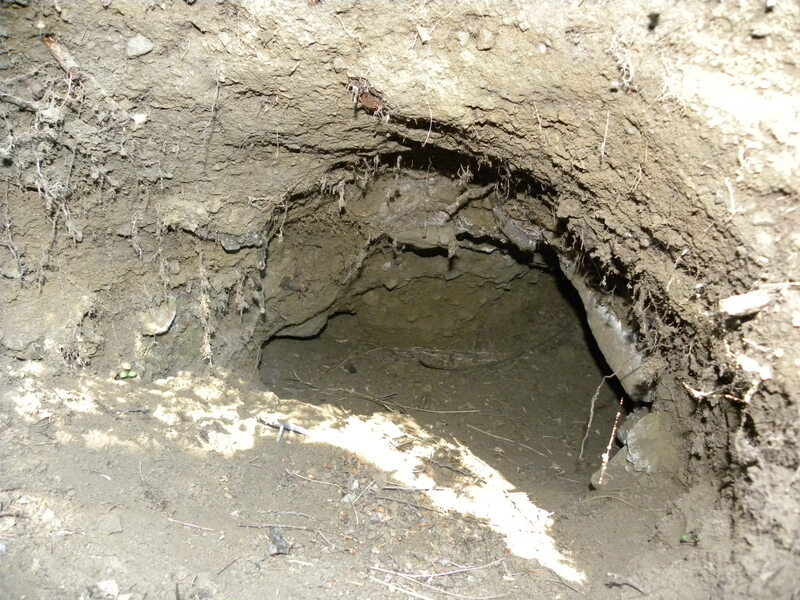 I tried to shine a light as far down as I could, but the den tunnel made a right turn downhill and exited at this bottom hole. The chosen site was not near an animal trail. 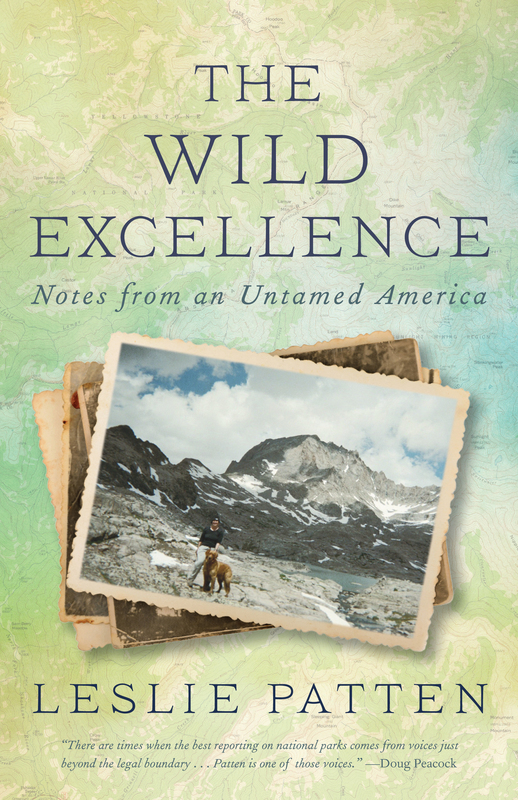 In fact, the trail made by the wolves going back and forth to the den was now overgrown. Yet I caught a wide variety of animals on my camera. Of course, the supercilious coyote appeared several times, even spending a long time peeing nearby on a log. A young black bear ambled bye. 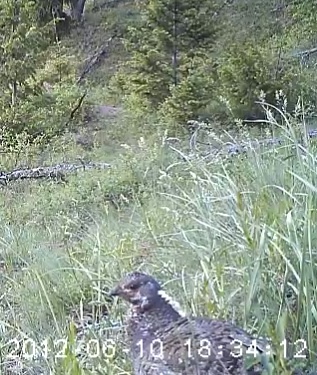 a cow elk explored the site; and a yet to be identified weasel-like animal that looks suspiciously like a wolverine–all these animals in just a few weeks visited this den site area. 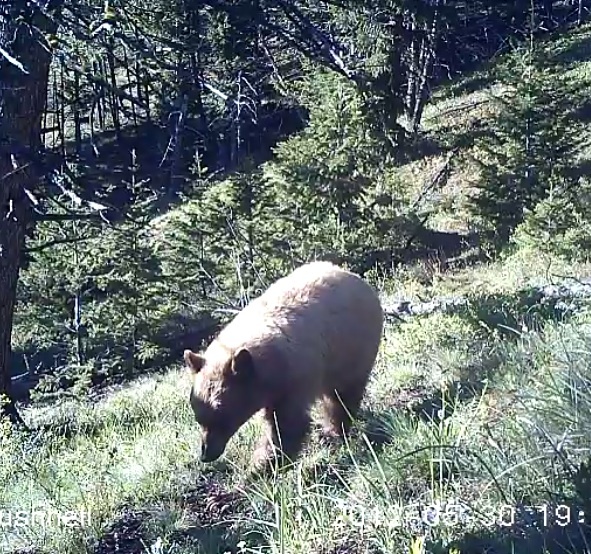 How lucky we are to have such a wealth of animal life in this special place we call the Greater Yellowstone Ecosystem. Just another day in the valley! LOL! You are having such fun! As usual, a very interesting post. 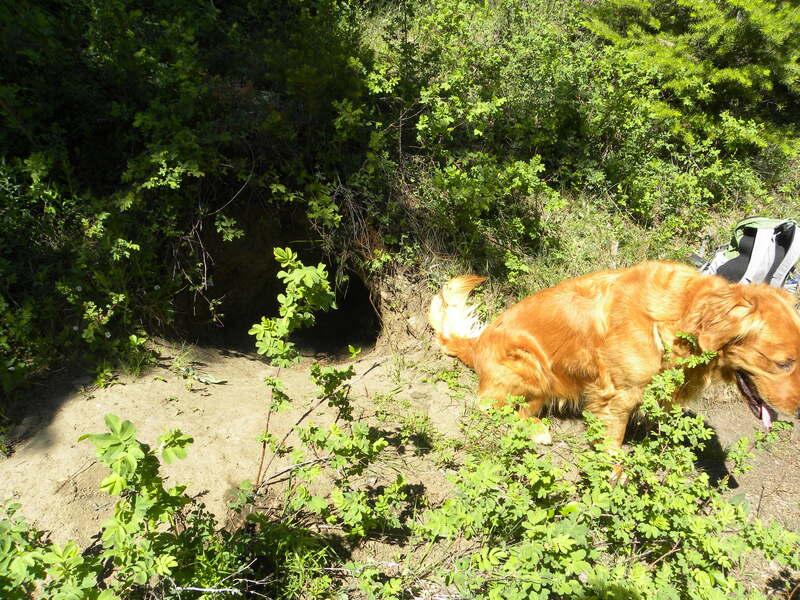 I have only seen a wolf den once, when with Chuck, and it was from afar. Scope definitely required!